Stainless steel handle w/ black finish. 7 1/4 in. overall opened, 3 1/8 in. 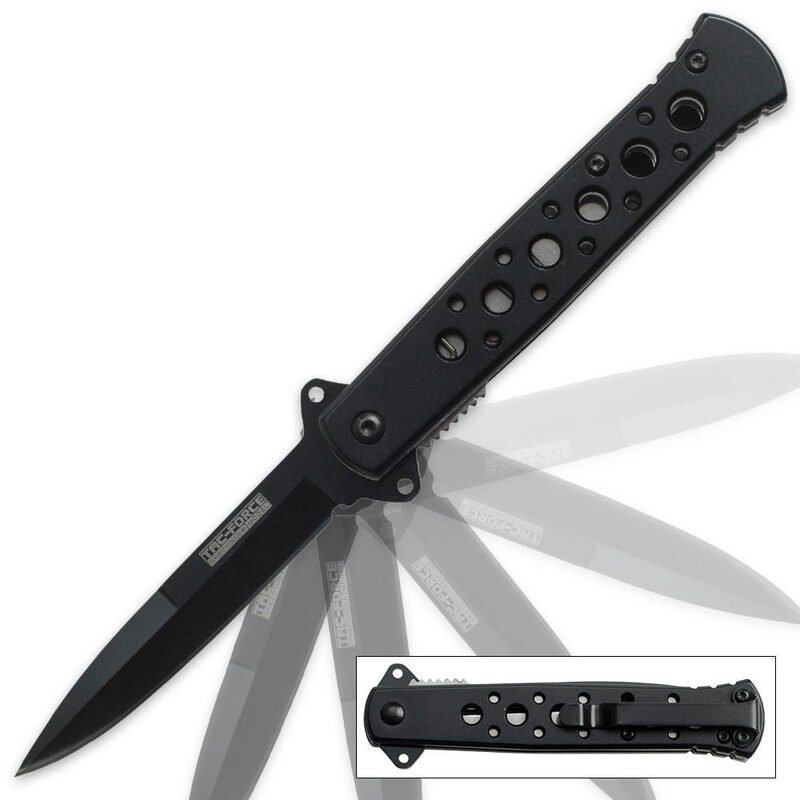 blade, 4 in. closed. I love stiletto knives, especially assisted opening stilettos. This knife, however, was very disappointing. It started out great, the blade itself is amazing, and the assisted opening functioned perfectly right out the box, but it was a little hard to open at first. The handle was a little loose at first, and after only two days without doing anything more than opening the knife, the screws started coming out and they can't be screwed back in. I was very happy with my other Tac-Force knives, so I may have just received a defective knife. A great knife for EDC. Fast opening, perfectly sized for low visibility pocket carry, arrives sharp. Little, but sharp as hell. My girlfriend likes it. This is a very sharp knife, and it looks sweet. The only noticeable issue with it is that there is a bar inside the handle that the knife hits sometimes when you fold it up. This causes a very minor chink in the blade. It doesn't really reduce the functionality and unless you look at it in a certain angle you wont see it clearly. I don't regret buying the knife though and I would even recommend it. If you have a torx screwdriver you can also tighten and loosen the spring to make it easier or harder to open. Just a reminder, this is a very sharp knife an its also very tempting to play with it. Be careful or you will cut yourself- trust me. Is a really good knife. Flips out fast and locks well. The only problem was a small dent in the knife's bllade but nothing the accusharp can't fix. Overall great buy.